Natural zeolites have many potential uses in the field of animal care.Zeolite is an EU approved animal feed additive (E568) for use as a binder, anti-caking agent and coagulent in feed for chickens, turkeys, rabbits, beef cattle, dairy cows and salmon. It is widely recognised as an effective aflatoxin and micotoxin binder and studies have shown that zeolite increases feed conversion rates and reduces mortality rates. Zeolite are inert, stable and non-toxic. This, combined with their other unique characteristics, allows them to be used as feed additives with multiple, complementary benefits. Natural zeolite provides a healthy and economical solution for odor and moisture control at barns, stables, pens and CFO (confined feedlot operations). 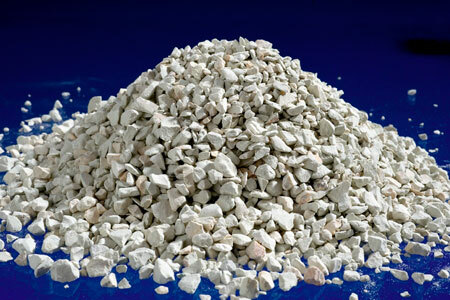 Zeolite is non-hazardous, non-corrosive, non-toxic, and 100% natural. It is simply mined from quarries and meshed to various sizes for various applications. Zeolite will eliminate urine-generated ammonia odors from stables, feedlots, paddocks, pens, litter boxes, hog poultry houses, barns, and transportation trailers. Capturing and holding ammonia (NH3) provides a safer and more comfortable environment for the animals, the operators and the neighboring community. The zeolite structure via CEC (cation exchange capacity) traps and holds ammonia and other animal odors without the need for chemical additives (i.e. : lime and deodorants). The trapped ammonia allows for a natural slow-release nitrogen fertilizer. The capture of ammonia prevents the loss of valuable nitrogen nutrients into the atmosphere which is common in present operations. Secondary benefits include the reduction of fly populations at the barn and manure pile. Ammonia, when inhaled can cause severe damage to the respiratory tract in both animals and operators. Even low concentrations of ammonia have proven to reduce or depress airway defense mechanisms. Atmospheric NH3 depresses the intrapulmonary phagocytosis and the bacteria from the airways and lungs. This results in a higher incidence and severity of pneumonia which is often encountered in young livestock. Studies have revealed that higher concentrations of NH3 over prolonged exposure periods result in decreased animal weight gain and conversion rates. Zeolite also absorbs moisture from livestock bedding. Zeolite, when added to bedding lanes is proven to ensure bedding lane longevity. Up to 40% savings in operations is experienced in large feedlots by the addition of zeolite to bedding lanes due to reduced stall maintenance and change-outs. A zeolite enhanced bedding lane provides many advantages, both economic and operational: reduces fly infestation, does not burn or crack animals hooves (as does lime) and prevents sinking. The granular form of zeolite is non-dusting. It is important to keep the bedding dry especially for new-borne and animals confined due to illness. Zeolite will retain moisture and air in the soiled bedding. This accelerates manure composting. Zeolite will not break down under trampling therefore providing better traction for animals and personnel even when the material is wet. Tagging is also reduced since the moisture is controlled. It is important to note that zeolite is easy to spread over the bedding lane and is effective with the first application. Improving air quality; reducing groundwater contamination.